"A girl should be two things, Classy and Fabulous." -Coco Chanel. Our wall decals are ideal for bedrooms, offices, living rooms, entryways, classrooms, even your car or glass shower doors! 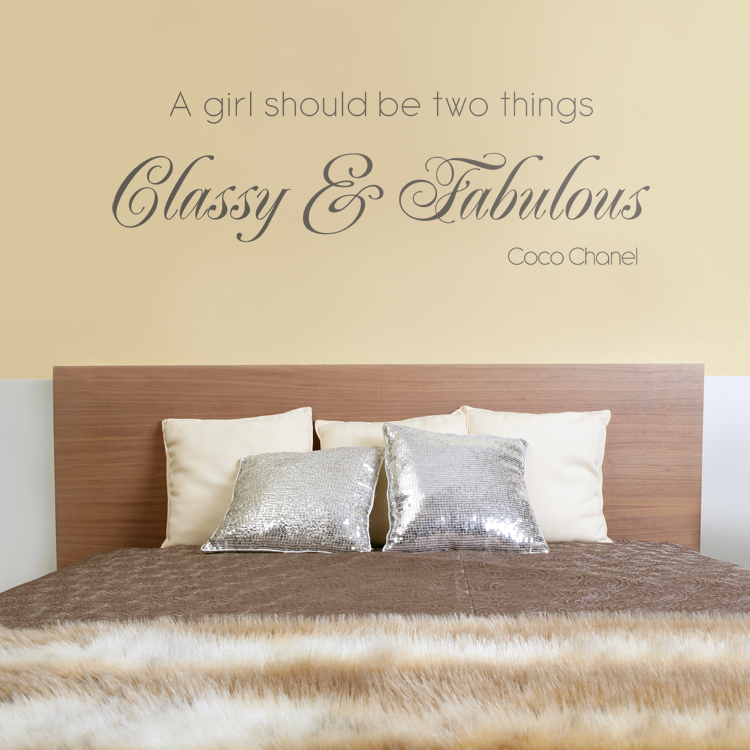 This wall decal comes in sections for easier application and so you can create your own look! Fantastically friendly sellers with great quality product, shipped quickly and in a very sturdy package, with great instructions and .. Bruce Lee!! Yes. We're very pleased. The inventory is amazing and customer service is outstanding!! We ordered the giant corner tree with leaves, set of six birds and a monogram for our daughter's room. We love this company and would recommend it to anyone. These are the best quality wall decals I've used. It looks better than I imagined! I can't wait to buy more - I even went around to all the areas of the house and made a "wish list" for future decals. I'm HOOKED! Btw, the customer service at Dali Decals is superb! Hey, just a shout out to one of your employees, David T. I inquired about Dali making some bike decals for me, and David took the reigns, made sure my document was a good size, resolution. His communication was great. By the way he treated me, you would think I was some big shot inquiring about a bulk order. I am not. I only wanted decals for my bike. Great customer service. Great communication. And I can't wait for my great decals. I purchased my first and second wall decal from Dali. Great product, easy to install great quality. I purchased a third from another company (sorry), not so easy to use, difficult to install not as good of a product overall. I am back to create a custom quote from Dali. I know I will receive good customer service as well as a great product! Thank you!